Jaya Arunachalam carries forward the political tradition of the Freedom Fighters of India, fighting not against colonial rule but for economic freedom for India's poorest: the women who survive in the margins and on the streets. By birth a Brahmin, a member of India's highest caste, Arunachalam was introduced to what would become her life's work by the poor women of her home state of Tamil Nadu. They were, she says, her teachers. As an organizer for India's Congress Party, Arunachalam tried inviting these women to participate in the political rallies she was sure would bring about much needed social change. The women replied that rather than listening to speeches, they would spend their time better by earning another rupee or two. In 1977, when floods hit Tamil Nadu, Arunachalam and her friends collected and distributed clothing, bedding, and food. After a year of this, she realized that the relief effort was not the solution. "It wasn't the flood that was the greatest disaster," she said. "It was the poverty." In 1978 Arunachalam, who was trained as an economist, formed the Working Woman's Forum, an organization dedicated to giving poor female workers what she perceived they needed most: access to credit. Initially, bank executives laughed at the idea of letting female street peddlers even walk into their hallowed financial institutions; they certainly weren't going to give them money. But Arunachalam set up a cooperative so that middlemen-actually, middle-women-would collect the loan money from the banks for the poor working women, distribute it to the actual borrowers, and take the loan re-payments to the banks on the women's behalf. Using tiny loans—"micro-credit" as it came to be know—Arunachalam's Working Women's Forum has brought economic aid to more than 700,000 women in over 3,000 villages and 1,600 slums. But it isn't a free ride. With the financial help, Arunachalam gives Forum members this admonishment: "Your poverty, the number of kids you have, and the treatment you get at home and workplace are of your own making. Swim or sink. Do it yourself. Fight your way out. Bring change in your life." "She gave me courage," says one about Arunachalam. "Without being able to sign my name, I earn, have an F.D., a passbook." Another says, "Getting trained in crafts, like embroidery, keeps a woman like me from being married off early." The social hierarchy of India is not as rigid now as it once was, but in Arunachalam's childhood, she remembers that when she played with children of a lower caste at school, the teacher would report it to her grandmother and the child had to bathe and change clothes before going home. She says the system always baffled her. After receiving a master's degree in economics, she married a man who, though educated and affluent, was not a Brahmin-and her parents refused to see her for 15 years. After her mother's death, her father finally forgave her. 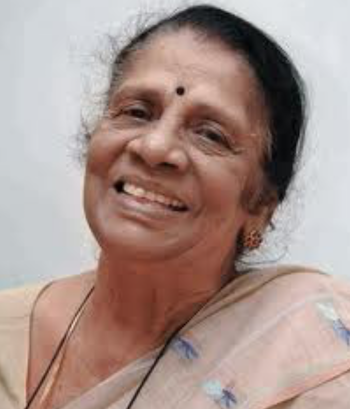 Now, Jaya Arunachalam has spent her life as an economic advocate for the lowest castes and for outcastes. It is work, and a constituency, of which she is enormously proud, saying that the women have become leaders. "They have become advocates and lawyers. Out of poverty, they came out to have a collective vision and conscience."